To capitalize the full potential of Google Shopping, one must fully understand the taxonomy of the product niche he is advertising and to assure the Shopping Feed structure follows the campaign segmentation strategy. We at Inchoo are Magento eCommerce specialists with high technical background knowledge. Having this synergy enables us to use the advanced online marketing industry standards and a development expertise to create powerful Product Listing Ads. The results are extremely efficient Google Shopping Campaigns. WE KNOW MARKETING AND MAGENTO! We are industry experts with in-depth technical knowledge! Magento certified and Google Shopping specialists, Google Analytics, SEO and PPC experts, all at your disposal! This store had a Google Shopping campaign before, but the feed was in bad shape and not managed properly by a previous Google Ads (AdWords) Agency. When we started working together, we reviewed their business, shopping feed and Google Shopping campaign setup. The results were fantastic – revenue went up by 118%, while the campaign cost were reduced by 20%. This store didn’t run Google Shopping before. Their revenue increased by 339% year over year after the advanced implementation of Google Shopping while the costs were only 65% higher. This online store did run a Google Shopping campaign with their former Google Ads (AdWords) agency, but pretty unsuccessfully. With our complete service they managed to push their online marketing capabilities high by astonishing 550% compared to the last year, for only 62% higher cost. 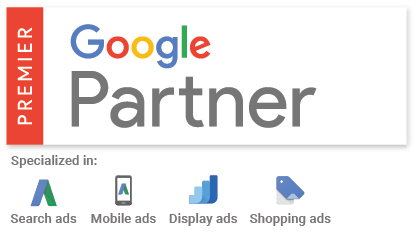 A lot of our clients, who wanted to use Google Shopping, had problems with their previous Google Ads (AdWords) management agencies because they struggled to set up the shopping feed. Such setup is the backbone of this campaign type. If it’s not set up properly, you will not use the full potential of Google Shopping. Implementation consulting – Automatic Item and Price Updates, Promoted products, Microdata markup, etc. There is a chance that your online store has a potential for similar results by using Google Shopping. Get in touch with us. We would like to hear your story. Are your Google Shopping Feeds optimised? Our expert consulting team will help you utilize the full potential of your campaigns.